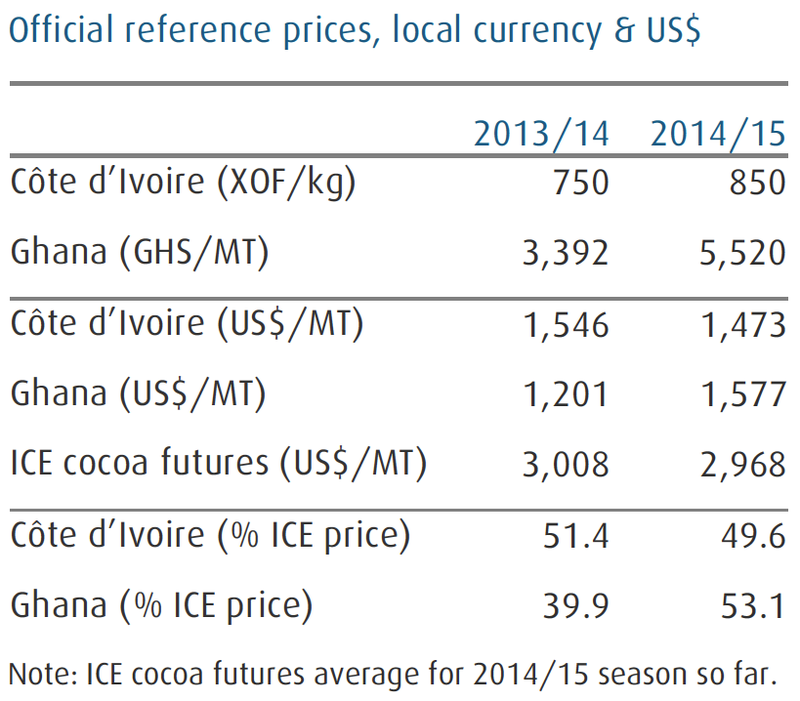 Commodity Analysis Report: The Ghana 2014-2015 Cocoa Main Crop Failure, the Possible Causes and Potential Impacts to the Global Cocoa Commodity Markets..
Cocoa originated from around the headwaters of the Amazon in South America. Its cultivation and value spread in ancient times throughout the Central and Eastern Amazonian region and northwards into Central America. Cocoa beans were used by the Native Americans to prepare a chocolate drink or chocolate and also as a form of currency for trading purposes and payment of tribute to the king. After the conquest of Central America in 1521, Hernan Cortez and his Conquistadores took a small cargo of cocoa beans to Spain in 1528, together with utensils for making the chocolate drink. Large-scale cultivation of cocoa was started by the Spanish in the 16th century in Central America. It spread to the British, French and Dutch West Indies (Jamaica, Martinique and Surinam) in the 17th century and to Brazil in the 18th century. From Brazil it was taken to SÃO Tome and Fernando Po (now part of Equatorial Guinea) in 1840; and from there to other parts of West Africa, notably the Gold Coast (now Ghana), Nigeria and the Ivory Coast. The available records indicate that Dutch missionaries planted cocoa in the coastal areas of the then Gold Coast as early as 1815, whilst in 1857 Basel missionaries also planted cocoa at Aburi. 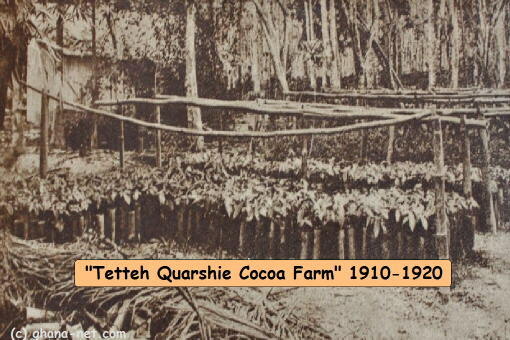 However, these did not result in the spread of cocoa cultivation until Tetteh Quarshie, a native of Osu, Accra, who had travelled to Fernando Po and worked there as a blacksmith, returned in 1879 with Amelonado cocoa pods and established a farm at Akwapim Mampong in the Eastern Region. GDP contribution: Most important export crop which accounted for 8.2 percent of the country’s GDP and 30 percent of total export earnings in 2010. Total production: Total production from 450 000 tons in 2000 to 900 000 tons in 2010. Ninety percent of total production grown by smallholder farms. Cocoa marketing: All cocoa beans are sold to Licensed Buying Companies (LBCs), which in turn sell to the only authorized exporter in Ghana, the COCOBOD (Govt. Agency) or to domestic industries for local processing. Main export destinations: European Union, Japan and the United States. Country’s foreign exchange: Important commodity for the country’s foreign exchange earnings (around 25 percent in 2010), and subject to regular policy interventions by the Government, including export tax, licensing arrangements and input subsidies. 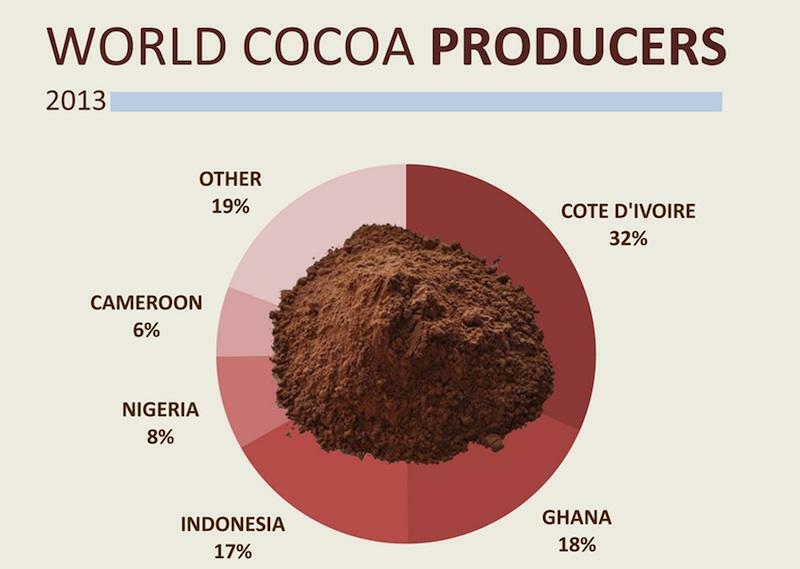 Second largest exporter: Second largest exporter of cocoa beans after Cote d’Ivoire. 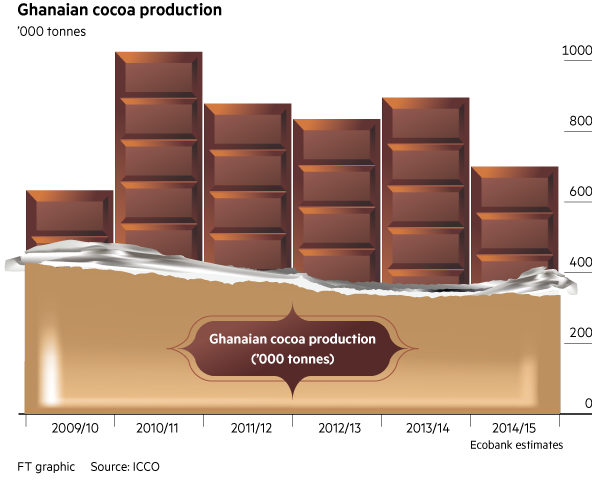 It has been estimated that in 2010/2011 Ghana’s exports of cocoa reached 1 004 000 MT (GAIN, 2012). In terms of world cocoa exports, Ghana has maintained its position as the 2nd largest exporter (by quantity) of cocoa beans for the period of 2005 – 2011. Cocoa butter export: The country ranked 8th, 9th and 7th in cocoa butter export in 2005, 2006 and 2009, respectively, while cocoa paste exports have decreased to such a level that Ghana was no longer ranked among the top 9 exporters of cocoa paste worldwide in 2008 and 2009, although between 2005 and 2007, Ghana ranked in the 3rd or 4th position. Moreover, in 2010 exports of cocoa butter and paste to the USA increased dramatically from 32 million USD to 86 million USD, most likely because of the higher quality of cocoa products produced in Ghana (GAIN, 2012). Highest export crop earner: Cocoa is considered to be the highest export crop earner for Ghana accounting for 8.2 percent of the country’s GDP and 30 percent of total export earnings in 2010 (Ghana Statistical Service, 2010; GAIN, 2012). Controlled marketing system: Ghana is the only cocoa producing country which has a controlled marketing system. External marketing is controlled by the state owned Cocoa Marketing Board (Laven, 2007). Employer: In terms of employment, the livelihood of about six million people (25 – 30 percent of the population) depends on the cocoa sector (Anthonio and Aikins, 2009). Cocoa producing households: In most cocoa – producing households, cocoa accounts for over 67 percent of household income (Kolavalli and Vigneri, 2011). Poverty reduction: Research has also shown that poverty reduction among cocoa farmers is clear, with surveys conducted in 1991, 1999 and 2005 indicating a reduction in poverty levels among cocoa producing households from 60.1 percent in the 90’s to 23.9 percent in 2005 against the national poverty rate which has fallen from 51.7 in 1991/92 to 28.5 percent in 2005/2006. 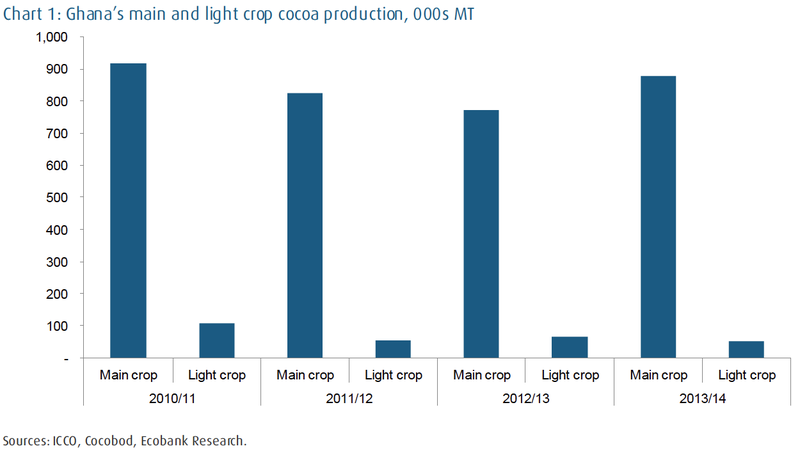 The sudden decrease in poverty levels for cocoa producers coincides with a period of favorable cocoa prices, higher yields, and increased production. Formation of COCOBOD: In recognition of the contribution of cocoa to the development of Ghana, the government in 1947 established the Ghana Cocoa Board (COCOBOD) as the main government agency responsible for the development of the industry. The Minister of Finance, Hon. Seth Terkper, announced a new price of GH₵345 per bag of 64kg gross for the 2014/2015 cocoa season. And an additional amount of GH₵5.00 as a bonus for each bag at the time of sale. This meant that each bag of 64kg gross weight of cocoa shall be sold at GH₵350. During the 2013/2014 season, each bag of cocoa was sold at a cost of GH₵212; this indicates 62.74% increment for this season. While Ghana pays a fixed price to farmers of 3,392 Cedis ($1,407) per ton, Ivorian farmers receive a minimum price of 750 CFA francs a kilogram ($1,540 per ton). At the beginning of the 2014-2015 cocoa season, Ghana’s COCOBOD projected a target yield of 1million tons. A projection that many analysts described as over ambitious from the onset. The rational of the COCOBOD team was that, the recent increase of producer price of cocoa by 62.74% should be enough economic incentive for the farmers to foster increased productivity. Ghana estimates its 2014/15 cocoa season output will be not more than 700,000 tons, down from an initial target of more than 1 million tons that had already been revised down to 850,000 tons, senior government sources told Reuters. There has been a crop failure and the latest indication is that our best (output) will be around 690,000-700,000 tons, undisclosed sources told Reuters. Bad seasonal weather, pests and smuggling prompted Ghana’s industry regulator, the Cocoa Board (Cocobod), to revise down crop estimates by 15 per cent last month (May 2015). But traders and analysts say that the shortfall could now be closer to a third of the original 1m tons it said that it would produce in 2014-15, as large pre-paid deliveries of the aromatic, dark bean have not showed up. With Ghana’s output normally accounting for about 20 per cent of global production, prices for cocoa — the essential ingredient for making chocolate — will be volatile until there is more clarity, traders say. The lack of information from Cocobod and its sales arm, the Cocoa Marketing Company (CMC), has frustrated some industry executives. The International Cocoa Organization (ICCO) has taken the initiative to downgrade Ghana’s 2014-2015 projected output by 22%. The estimate for the Ghana crop – the world’s second largest was slashed by 114,000 tons, to 696,000 tons. This represents a 22% year on year contraction. However the public and investor community is still awaiting an official explanation for the poor harvest. One thing is certain, Ghana’s CMC has oversold by 200,000 tons. And it is worth noting that this amount is a lot of cocoa. Analysts forecast that the crop could be the lowest since 2009. Bad weather: Heavy rainfall between August and October had prevented cocoa trees from flowering. A lack of pesticides: Other farmers complained about the scarcity and expense of fertilizers and pesticides. There was also a lot of reported smuggling of the pesticides to neighboring countries. Some analysts and traders say that Ghana’s financial situation may have exacerbated the cocoa farmers’ problems. Last year growers received their fertilizer and fungicide supplies from Cocobod late, and much of the chemical application proved to be ineffective as it was washed away by the rains, says Edward George, analyst at pan-African bank Ecobank. Aging farming population: Majority of the smallholder farmers are old and need younger farmers to take over the operations of their farms. Disease: Cocoa husks shriveled by fungal black pod and fat red capsid bugs feeding on cocoa trees. Weak currency: The sharp fall in the cedi, Ghana’s currency, also meant that it is more lucrative for farmers to smuggle their cocoa rather than sell to Cocobod. Weak cedi inadvertently provided incentives for farmers and extension workers to resell pesticides and cocoa in neighboring countries where they could earn more for their product. Smuggling: Increased smuggling by farmers and extension workers of both cocoa and pesticides where prices for their goods are more lucrative due to stronger currencies in those neighboring countries. Cocobod finances Ghanaian buying companies, which act as middlemen, to purchase the cocoa from the farmers. Untimely/poor resource allocation: This year, the funding distribution was delayed, leading to more farmers smuggling their cocoa to neighboring Ivory Coast, says one cocoa trader. Strong Harmattan wind: The seasonal Harmattan winds from the Sahara dry the cocoa trees and soil and can lower production of the “mid” crop or the annual second crop in West Africa. A strong hot and dry pattern can even affect the next main crop production potential. Some local weather forecasters have tried to cite the Harmattan winds of this season as culprits even though international weather forecasters disagree. Inadequate rainfall: It rained but supposedly at the wrong time in the season and very heavily thereby destroying flowering trees. Late application of fertilizers: Delayed supply of fertilizers due to late supply from the Cocobod. Reduction of a government spraying program: this agriculture extension service from the Cocobod was also curtailed at the beginning of the season due to funding issues. 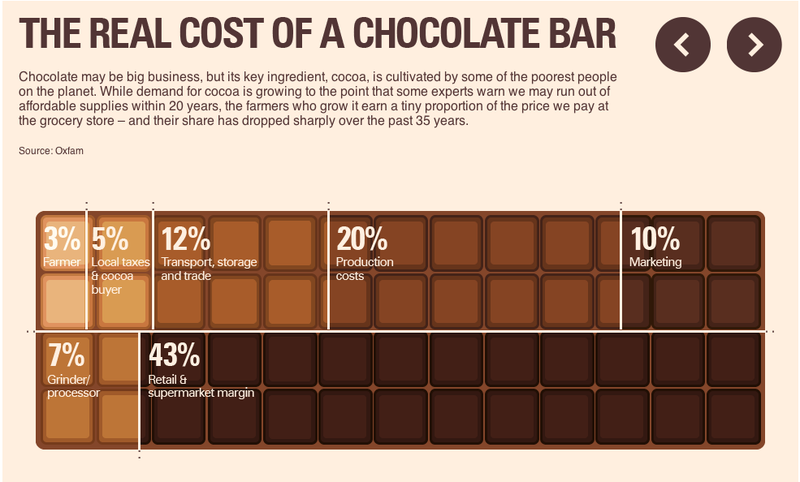 Reduced cocoa revenues: This one is self-explanatory. Reduction in production means less produce to be taxed by the government either at the ports or at retail stores through sales taxes/VAT. Increased national debt: Every year, a group of international banks provides a syndicated loan of about $1.5bn-$2bn to finance partly Cocobod’s operations. In 2014, banks including Deutsche Bank, Natixis, and Barclays provided a loan of $1.7bn. COCOBOD went for this loan to finance the purchases of the 2014-2015 season. So with interests accruing daily, it is only natural that this will cumulatively increase the nation’s foreign debt. Compromised Fiscal and Credit profile: Global financial markets are likely to react negatively to this new development by either downgrading Ghana’s credit rating or at least issue negative assessments of the country’s cocoa sector management which will thereby cause investors to react negatively. As at the time of this report, Moody’s has reportedly downgraded Ghana’s rating as a result of negative news coming from the cocoa sector. Inflation: the country’s current inflationary issues started due to commodity price drops last year. This caused a foreign currency shortage at the Bank of Ghana, which thereby triggered a national demand-pull inflationary phenomenon. Unemployment: Actors in this sector will be reducing their staffing needs accordingly due to the poor harvest thereby making an already bad unemployment situation in the country even worse. Decreased foreign exchange reserves: Cocoa is one of Ghana’s highest foreign exchange earners. Hence this poor harvest will directly and indirectly cause foreign exchange shortages in both the short and medium terms for the country. 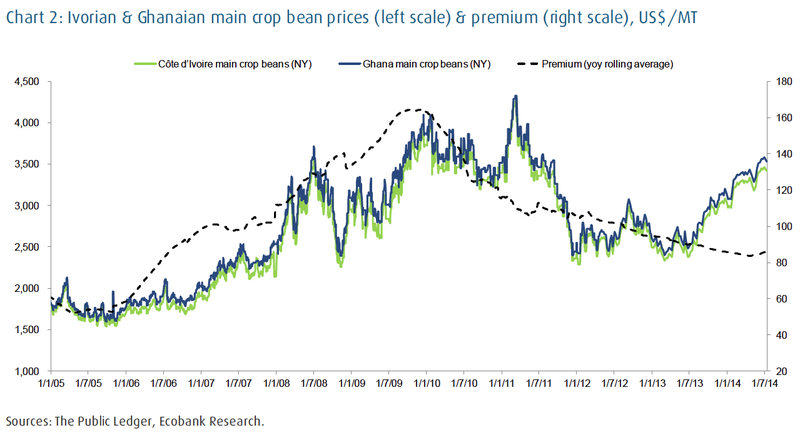 Diminished International credibility: Ghana has oversold its crop by promising to deliver more to buyers than it has been able to produce, but blamed the problem on the output shortfall. Downward budget revision and adjustment: Government will need to revise its budget for 2015 due to the cocoa crop failure to accurately reflect revenue losses. Decreased standard of living: The majority of the primary producers or farmers in Ghana’s cocoa production value chain are smallholders. And thus, Cocoa is usually their main source of income. Hence this poor harvest means that they are going to face a diminished standard of living since they now have less money to cater for their basic needs such as food, school fees for their kids, healthcare, etc. Diminished real incomes: One means by which farm households try to make ends meet in times of crop failure is to release labor to earn income elsewhere; at the same time, this reduces the burden on household food reserves. The net effect on farm productivity depends on whether this migration continues into the next farming season, thereby reducing the household’s labor supply. This will be the case where shortage of food is so acute that the household must depend on the earnings of some of its members to feed the rest of the family until the next harvest. Reduced life expectancy: If a farmer is unable to afford decent quality health services for himself or his pregnant wife or child, due to the fact that their only source of income is facing adverse economic pressures, then naturally he will soon find himself facing potentially life-threatening threats risks. Some of which can be fatal. Adverse effects on the revenues of companies in the secondary level of the Cocoa supply chain: If companies in the secondary level of the Ghana cocoa supply chain such as LBC’s, Graders, Exporters, and shipping companies, etc. cannot find enough Cocoa to fill orders then it follows to reason, that they will in turn generate less proceeds in the form of commissions, etc. from selling the product onward to the main regulator, the COCOBOD. Employment contractions: If LBC’s don’t have product to procure, they simply do not need as many employees for collecting and transporting the Cocoa and hence might seriously consider laying-off workers temporarily. Decreased contribution to GDP: it is only normal that processors and markets will be paying much less in taxes to the government in the form of employee taxes, customs duties at the ports, etc. While it is too soon to say how much of an impact chocolate consumers will feel from Ghana’s output problems, the uncertainty surrounding its supplies has already pushed the cocoa price up 10 per cent since late April to a seven-month high of almost £2,090 per ton. Supply chain disruptions: If chocolatiers cannot fulfill orders due to constrained supply of Cocoa, it is very likely that they will be unable to fulfill certain orders from customers such as supermarkets, Café chains, etc. Thereby adversely affecting their annual distribution plans. Reduced revenues/profits and decreased potential sales for confectionaries: Traders are also paying higher premiums for immediate delivery of Ghanaian cocoa in the physical market as they scramble to source the beans. That is adding as much as another $300 per ton over the futures market price, compared with $80-$180 per ton normally, say traders. Ghana’s cocoa beans are considered to be of the highest quality, with little waste produced when processed compared with beans from other countries. About half of Ghana’s cocoa is sold to chocolate makers in Japan, who use it in up to 90 per cent of all bars the country produces. Cadbury in the UK relies on Ghanaian beans for some of its chocolate production, as does Swiss chocolatier Lindt. If chocolatiers cannot produce chocolates, they cannot meet sales orders. And if they cannot fulfill sales orders then they cannot generate revenues and profits for their shareholders. Unemployment issues for workers in this sector: confectionaries and other manufactures of cocoa related products might have to lay off workers. Retail outlets, restaurants and businesses: These actors in the value chain might not be able to meet the ever-increasing consumer demand for chocolates as a result of limited supplies from confectionaries and related manufacturers. Increased cost of chocolates: Over the last twelve moths almost all of the world’s top 10 chocolate producers have hinted at increasing the prices of chocolates due to increased global demand which seems to be outstripping supply. 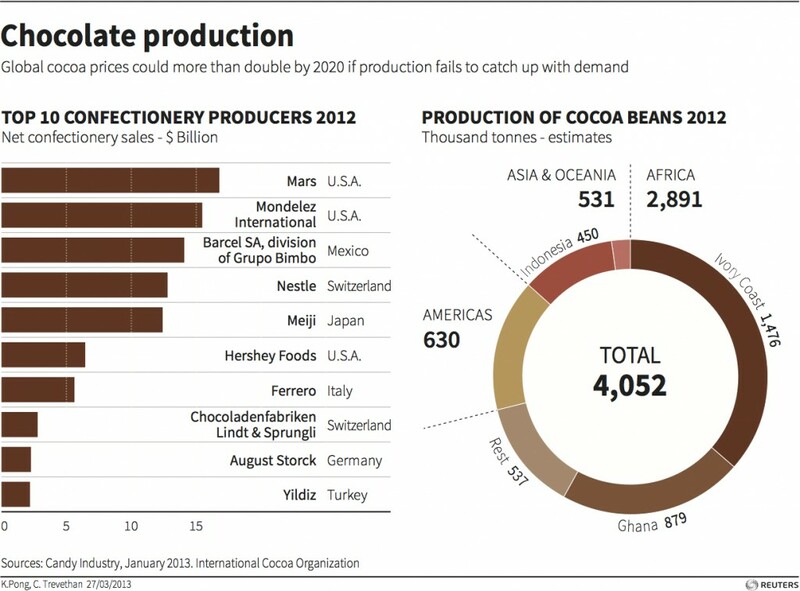 Hence such a bad crop year from the world’s second largest cocoa exporter only serves to exacerbate this problem. Quality issues: faced with the prospect of limited raw material supply, manufactures are more likely to start tinkering with their chocolate formulas by adding more preservatives and additives; and thereby reducing the quantity of actual cocoa in their product to compensate for the unavailability of sufficient cocoa on the global commodity market. Potential shift to alternatives: the price elasticity of chocolate might move consumers to alternative deserts and candy categories since consumers might not want to pay the much higher prices for the same product. Loss of consumer loyalty: this category is currently facing a loss of consumer loyalty and interest due to the price increases and quality issues. Need for a fundamentally sound macroeconomic support: The government needs to work harder to improve macroeconomic fundamentals such as inflation, foreign exchange, revenue collection, budget deficit remediation, monetary policies, etc. since any structural weaknesses in any of these fundamentals always has an increased likelihood of rippling through other sectors of the economy including the Cocoa sector. To further address the fiscal constraints, efforts would need to focus on raising revenue, cutting expenditure, and reducing the reliance on short-term domestic borrowing to finance the budget deficits, etc. Need for a fundamentally sound microeconomic environment: Government should work with actors in the Cocoa sector to address structural weaknesses in the sector in order to help make them more efficient and competitive in the global marketplace. Diminishing factors of production due to competition from other growth sectors: Ghana’s economy has been growing at a very rapid pace over the past decade. And this means that there will be new growth sectors such as tourism, etc. competing with the Cocoa sector for the same low skilled workers, land for cocoa cultivation, etc. Government should look into implementing short, medium and long-term policies to help mitigate against this risk. Streamline cocoa harvest forecasting to improve credibility: Ghana has been engaged in commercial cocoa production for over two centuries. By now we should have streamlined processes to help us forecast future weather issues that could impact the crop yields, or prudent fiscal management policies that will ensure that we have enough budget reserves to procure essential farming inputs for our farmers on time. This will help bring stability and predictability into the sector and help improve our credibility in the marketplace. Streamline weather management in the sector: Consultative Group on International Agricultural Research (CGIAR) published an analysis that says the world will suffer a massive loss of area suitable for growing cocoa as temperatures continue to rise and rainfall patterns shift. 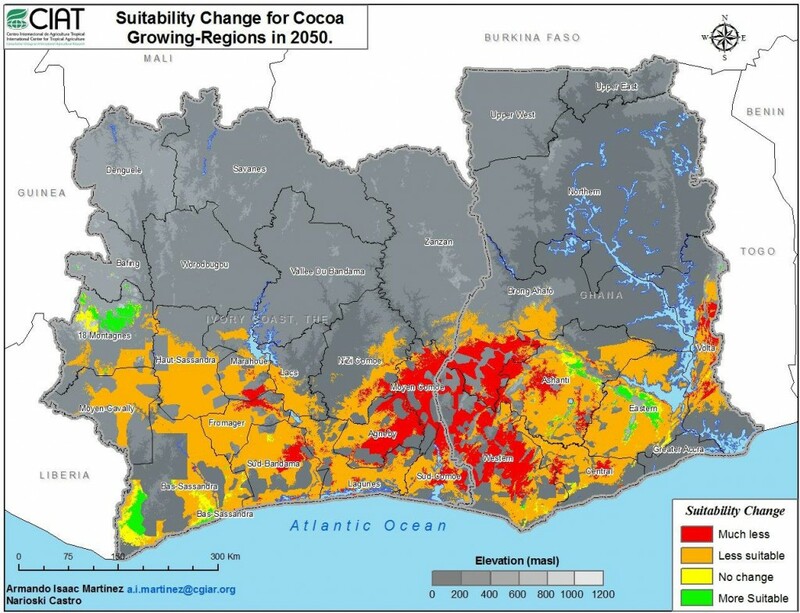 Figure 1, below, shows the drastic potential decrease in the viable cocoa-growing areas of Ghana and the Ivory Coast by 2050 due to climate change. These two countries produce 60 percent of global cocoa, but by 2050 cocoa production by these two leading global producers will be crippled. The authors note that smart farmers will certainly try hard to adapt and modify where and how they grow cocoa and that there may be opportunities to avoid the worst damages if farmers shift to other crops, like cashews. Fair-trade policies: Fairtrade aims to change the way that conventional international trade works, building fairer trading relationships between consumers and companies in the developed world and commodity producers in developing countries. 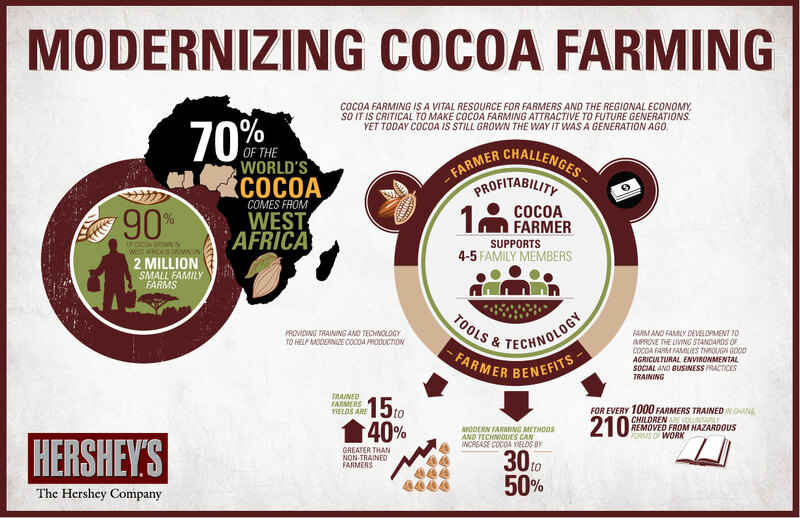 Cocoa farmers’ organizations get a guaranteed minimum price for their cocoa beans, which covers at least their cost of production and gives them the security to plan for the future. Without Fairtrade, farmers’ organizations sell into the conventional market, where the price of cocoa fluctuates and can fall below the cost of production. Sustainable farming practices: Fairtrade policies should help improve sustainable farming practices for the near and long term horizons in the sector. Improving the rights of farmers: The government should work to improve the rights of the smallholder farmers. Especially the female farmers since they are becoming an increasingly significant and substantive demographic in the sector but usually do not have equal land rights as their male counterparts. This should help improve crop security in the sector since the female farmers will then be able to better plan for future farming activities without uncertainty. Dissemination of disease management best practices: The government should work collaboratively with the farmers to develop and disseminate effective disease management practices for the long-term prosperity of the sector. Fertilizers: Going forward the government should put in place reliable and predictable fertilizer supply programs that farmers can use to plan their farming activities appropriately. This should help mitigate against the incidence of sporadic workflow disruptions as we are seeing in the cocoa farming life cycle this past season. Streamlined payment to sector actors: CMC operations have not been adequately computerized to streamline payments, and congestion at the ports is common. The other reason is that rent – seeking opportunities available for those who grade, accept, and pay for cocoa, given the congestion, might discourage them from streamlining the processes given the infrastructure. The government needs to address this structural inefficiency in the value chain before it starts creating ripple effects. New generation of farmers needed: Ghana’s inability to engage more young people in agriculture production to replace the aging farming population is of great concern to actors both local and international. The government should either come up with incentives and new programs to help attract the young farmers and entrepreneurs into this sector or begin working with large-scale agribusiness entities to come in and build mega-plantations to help transform the sector for future prosperity. Illegal Gold Miners: Cocoa farming in the country has over the years been increasingly competing with the mining industry for land, water resources and labor. This phenomenon, it said may have been exacerbated this season, following the lower producer price offered to Ghanaian farmers during the previous season. Correction action plan: The government needs to not keep International and local stakeholders and investors in suspense by delaying its full report on what went wrong and what it is doing to correct the issue and its associated timeline for wide ranging cocoa sector reforms. Inflation and Cedi crisis: The situation of both the local currency and inflation worsened quite drastically during the run up; to the main season and shown by the graph. Hence it was only natural that the government was unable to provide the necessary resources needed to fund inputs for the sector in time. Mistakes happen in life and I think that the most important thing is that our officials at Cocobod should learn from this experience. And accept responsibility. Timing of main and light crop seasons: Being that the light crop season leads right into the main crop season, Cocobod officials do not have enough reaction time to implement critical corrective action plans that might be necessary to turn things around. Hence we need to be more proactive in dealing with potential risks that might impact the season rather than just react to them post factum. Farm input procurement cycles: Going forward, Cocobod should work with stakeholders to implement procurement plans that will be well in advance of the season. By doing this, they will be able to mitigate against temporary macroeconomic hiccups that could end up being costly to their seasons outputs. You will think that for a country that has been engaging in this activity for over 60years we will know this by now. Hope for strong light crop: In 2011, Ghana’s light-crop cocoa harvest, which produces smaller beans, more than doubled to 97,965 metric tons in the 12 weeks of the season to Sept. 1, according to the Ghana Cocoa Board, which regulates the industry. Let us hope for another such season to compensate for some of the main crop’s shortfall. Ghana cannot afford revenue decreases at such a sensitive time: Ghana’s economy is already experiencing significant fiscal challenges which culminated in the IMF bailout. Hence it needs every single pesewa it can get in order to improve and stabilize its balance of payment deficits. Regulators at Cocobod need to keep this fact in mind. The need for integrity and effective communication: The management of the Cocobod needs to come out with a very clear and honest cause – effect assessment of the situation. Premium on Ghanaian cocoa at risk: According to the ICCO, Ghanaian cocoa enjoys up to a 5% premium over Ivorian cocoa due to its quality. However, it is important to note that, this privilege is not going to last if we continue to mismanage our cocoa sector. Holistic economic management: Cocobod and the government need to understand that, increasing the producer price while the cedi loses value defeats the whole purpose since a devalued currency adversely impacts the real incomes of farmers. Negative spillover: Upon critical evaluation of this whole cocoa harvest fiasco, it becomes obvious to the discerning analyst that this spillover was caused by externalities such as fluctuating commodity prices on the international commodity markets and poor local policy management with respect to the runaway public sector wage bill (Single Spine), and an ever increasing government expenditure bill stemming from many poorly planned projects. 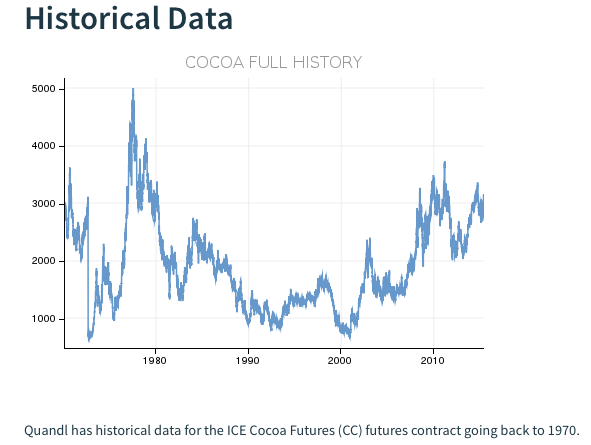 This in effect caused the government to go broke at a very sensitive time of the cocoa season cycle thereby setting in motion, a series of negative ripple effects in both the cocoa sector and the economy in general. Playing possum should NOT be our recourse to such an important national economic and social issue. Anang Tawiah is a Business and Technology Investment Consultant based out of New York City. He specializes in the areas of Investment Risk Management, Business Strategy, Digital Strategy and Analytics. He can be reached at anang@labaddi.com for further inquiries. “Upon critical evaluation of this whole cocoa harvest fiasco, it becomes obvious to the discerning analyst that this spillover was caused by externalities such as fluctuating commodity prices on the international commodity markets and poor local policy management with respect to the runaway public sector wage bill (Single Spine), and an ever increasing government expenditure bill stemming from many poorly planned projects. This in effect caused the government to go broke at a very sensitive time of the cocoa season cycle thereby setting in motion, a series of negative ripple effects in both the cocoa sector and the economy in general.